You can’t help but notice their shiny, silver campers on Cycle Oregon events. You may have piled into their photo booth with a group of friends and goofy props to have your picture taken. And you may have even seen their team, decked out in matching kit, having a blast on one of the legs of the Classic. 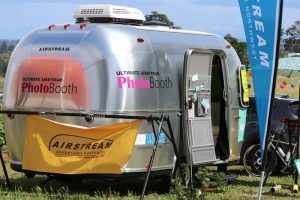 Well, all of these things are thanks to Airstream Adventures Northwest and for the last six years they have been one of Cycle Oregon’s most visible sponsors. Ted Davis, the founder of Airstream Adventures NW was fortunate enough at a young age to spend most of his summers in campgrounds with his grandparents. One day his grandpa pointed out an Airstream to Ted and commented that “those are the best of the best”. That little nugget of wisdom stuck with young Ted and eventually became the inspiration behind opening the first Airstream-only dealership in the US. AANW became involved with Cycle Oregon after several casual chats between Ted and his neighbor (who was a Cycle Oregon board member, but that was probably just a coincidence). The neighbor mentioned how much Airstream Adventures Northwest and Cycle Oregon have in common – they both appeal to people who like sleek shiny things, love the outdoors, and are passionate about good causes. So, the two teamed up and the rest is history. Ted and his team aren’t just sponsors in name only, they also love to ride. AANW puts together a team of riders each year for Classic. These 7-12 riders get to eat fancier food, camp in the understated opulence of Airstream trailers and, perhaps most importantly, wear cool matching kits. The money they raise is donated to Children’s Center, a child abuse intervention center, of which Ted holds a board position. 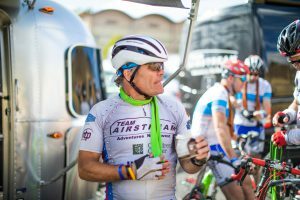 One of Ted’s favorite aspects of Cycle Oregon is “how it brings people together, instead of dividing them“ and he hopes that his team becomes known as “the nicest people out there”. Best of luck Ted – there’s a lot of competition in that category.